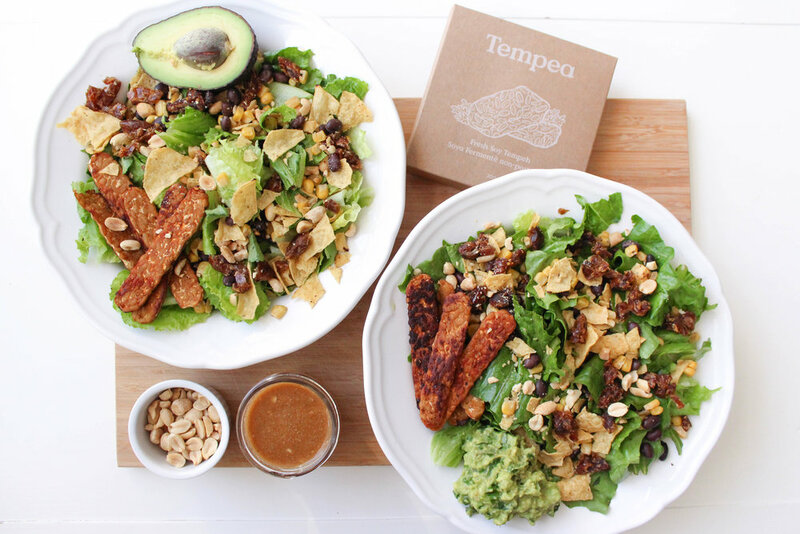 Place the tempeh strips in a shallow, square or rectangular container. Add all of the marinade ingredients and let sit while you prepare the rest of the meal. In a large pan, add the corn and black beans and cook over medium heat for 2 minutes. Add the garlic powder and salt and pepper and cook for another 2-4 minutes, stirring as needed. Remove from heat. Mix all of the dressing ingredients in a sealed jar or container and shake/stir thoroughly. Set aside. In the same pan used to cook the corn and beans, add the tempeh strips in a row, ensuring there’s no overlap. Cook on one side for approximately 6 minutes then flip the strips and cook on the other side for another 6 minutes. To assemble, add ¼ of the lettuce to each bowl. Top with a portion of the chopped dates, corn and beans, crushed tortilla chips, crushed peanuts, ¼ of an avocado, and cilantro. Pour over ¼ of the dressing on each bowl and serve with ¼ of the tempeh strips.